Today’s secret ingredient for Friday Foodie Fix is pepitas. In case you are not sure what that means, they are pumpkin seeds. If you are like lots of folks this week you might be carving pumpkins and pulling out lots of seeds. Did you know that pepitas are a popular ingredient in Mexican cooking? When you remove the white hull, they are a medium dark green seed and have a wonderful flavor. That flavor is wonderful roasted too. You can buy pepitas both roasted and raw and in the hull or not. I use mine in a wonderfully delicious dessert that I promise to share before the holidays arrive. It will be a gift you want to make for yourself. 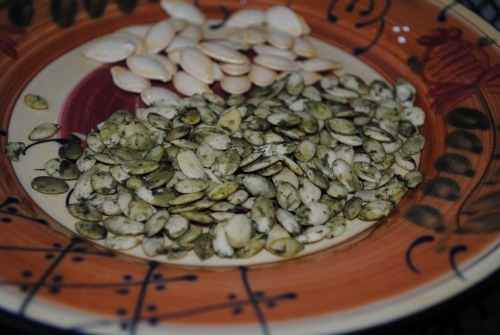 So how do you use pepitas? How do you buy them? Do you only eat them after you take them out of your carved pumpkin? Hey, no pepitas yesterday but if you missed out on the Go Ahead Honey, It’s Gluten Free at Hogwarts, you better go back and read that first. Share your recipe title along with your name and blog name. example- Diane@ The WHOLE Gang-Roasted Balsamic Chicken with Figs and Onions. Link to your individual post, not your homepage and then link back to this post. 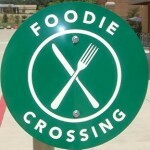 This completes the circle and allows your readers to find more recipes using the secret ingredient. Include your name and recipe title. Please link back to this post in your recipe post. Please follow these guidelines so I don’t have to delete your link. Every week some get deleted. Next week’s secret ingredient is …… lentils! Wow Shirley, I thought for sure you would have some honey roasted pepitas for us. OK, if you ever get around to figuring that one out, come back and share it. I think your honey and pepitas would be a great combo.